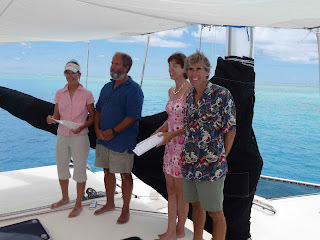 titular owners of the reefs. When we approached by sea, it appeared to be a hole in the ocean which was calm; the boats anchored there looked for all the world like they were anchored in the middle of the ocean. 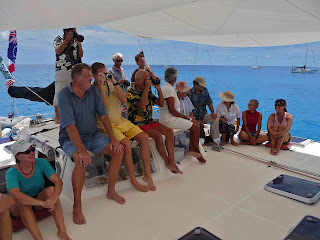 While we had considered carrying on past the reef as our passage was going well, we decided to stop and have a look. 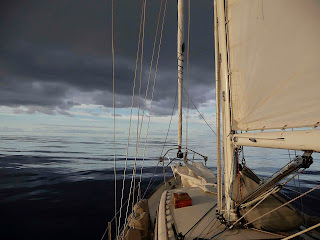 We had left Nuku’alofa in a very good wind on a very rainy day. 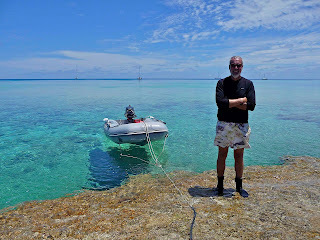 The passage here was notable for reasonable winds and seas and gloriously, no seasickness! message said, “WYMM” (will you marry me) and she had said an enthusiastic “yes”! 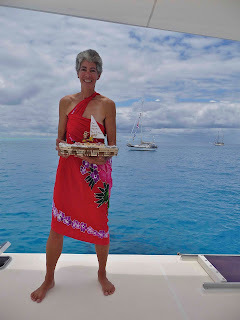 While we walked on the reef that afternoon, we told them that some other friends of ours also anchored here at Minerva were both ship’s captains and had performed a wedding ceremony at Suwarrow, legally marrying another cruising couple. Their eyes lit up but they needed to think about it more. The reef is fascinating. We were able to walk on it at low tide. It was a few hundred feet wide blocking the ocean swells from reaching inside except for a little bobble at high tide. 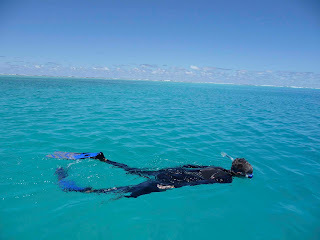 We snorkeled just inside the reef and found a little microenvironment there. As we swam back to our boats, we splashed quite a bit because we were cold and swimming hard. Alene called out “shark” when she saw the gray shark that had come to investigate the sudden splashing. As we stopped and hung in the water quietly, he swam silently away. 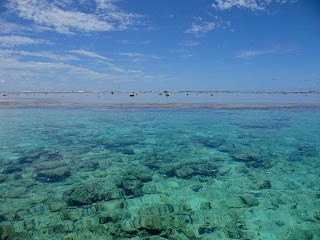 Later we snorkeled outside the reef where we found gorgeous and healthy coral in abundance. 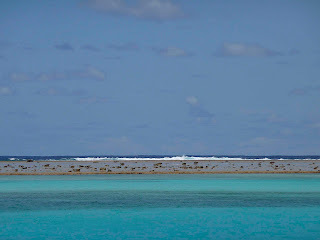 dingys and all the guests to the pass, anchored, and everyone snorkeled outside on the reef. What a day! We were so happy to be there to share that great moment with them. 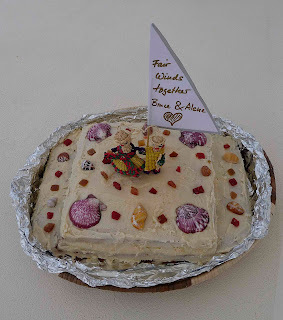 to us. 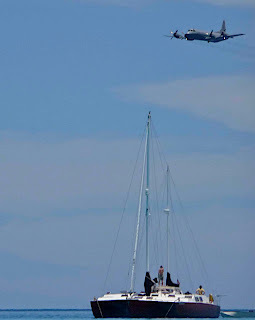 While some may feel paranoid from the surveillance, we found the attention comforting—were we to have trouble en route to New Zealand, obviously they were aware of our presence and available to help. 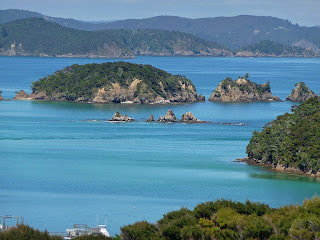 Eventually, it came time to leave and head on passage to New Zealand. Everyone takes this passage very seriously and we all watched the weather like hawks. 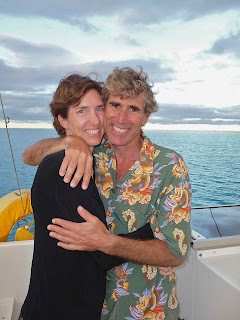 Richard and I had engaged the services of a weather router to help us pick our moment to leave, but it still felt uncertain as nobody can know the weather for sure and several boats left the day before we did. As luck would have it, our delay meant we were just at the outside of the one major frontal system that passed through when we approached New Zealand. except for one day where, although gales had been predicted (35-45 knot winds), and even our weather router wrote a special e-mail to warn us about this, we experienced nothing of the sort, no wind over 26 knots and that from behind, so we counted ourselves mighty lucky to have missed that little storm. Apparently, the weather was fairly extreme in NZ because we received a couple, “hang in there” type e-mails from friends assuming we’d really been blasted. We were not and for that we are eternally grateful. 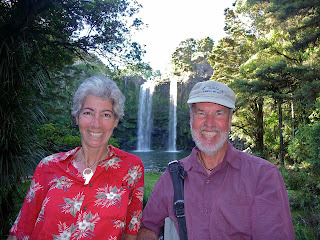 As Richard said, “It’s better to be lucky than good.” Our main frustration on the passage was the slow going, but, we were rewarded in the end with a passage without boat damage and arrival, at last, after 4 ½ years of travel with this as our destination, at the Bay of Islands, NZ. 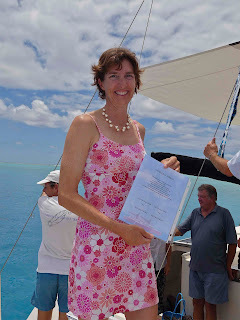 It is an amazing feeling to have achieved this final goal in our travels by boat. the many things that would be scrutinized and removed from the boat, but the officials were polite and rational and, other than all fresh produce and our garbage, nothing was taken away. So our next chapter includes travel in New Zealand to see more of the country and, possibly, if my license is finally approved (in the final stages at this point), some work here in the country. As always, our plans are fluid and we’ll continue to keep in touch.